서울역 앞 대우빌딩에서 퇴계로 방면으로 오시다가 남대문시장(Gate 6)건너편 해인약국과 우리마트 사이 골목길로 우회전 해서 40m 올라오시면 왼쪽에 검은색 간판(Seoul Backpackers)이 있습니다. 4호선 회현역 4번출구로 나오셔서 왼쪽 첫 번째 골목으로 40미터 올라오시면 왼쪽에 검은색 간판(Seoul Backpackers)이 있습니다. 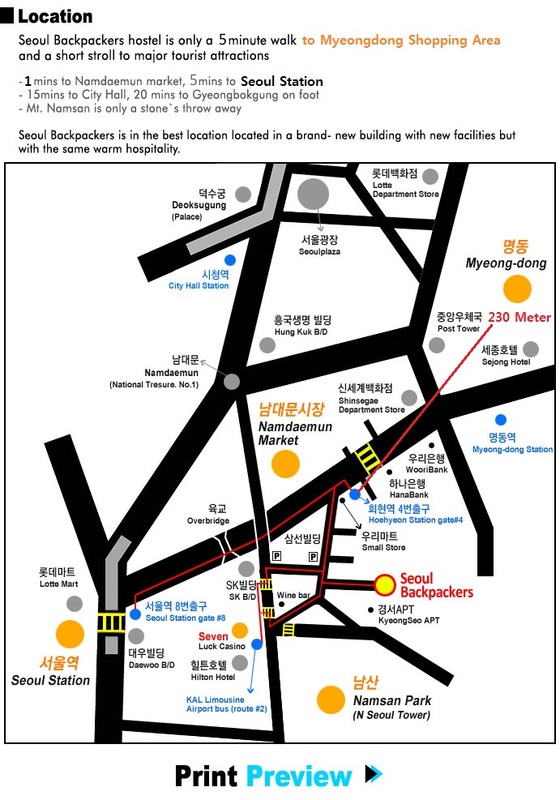 Seoul Backpackers is in the best location located in a brand- new building with new facilities but with the same warm hospitality.